John Bell, London & Edinburg 1778 - This is "Bell's Edition". "The Poets of Great Britain complete from Chaucer to Churchill". Eight Volumes beautifully bound in Four. Three-quarter red leather gilt, spine gilt very bright. Marbled boards. 9 x 13 cms with 12 cm shelf run. Each book frontispece woodblock engraving "Grignion Sculp". Spines decorated with five gilt rules. An early scortch mark along external base of Volumes (see image) but hardly detracts from a beatifully preserved set. Each volume neatly inscribed in ink "Westover". Volume Eight shows a 40 page glossary "Explaing Old and Obscure Words in Spenser's Works". [Charles Grignion, Etcher. British, London 1721 - 1810. The Westover inscription is also curious. It was one of the manors granted to Thomas West Lord De La Warr by Henry VIII, from the property of a dissolved monastery]. N.B. Text spelling of author's name is the correct "Spenser" throughout. 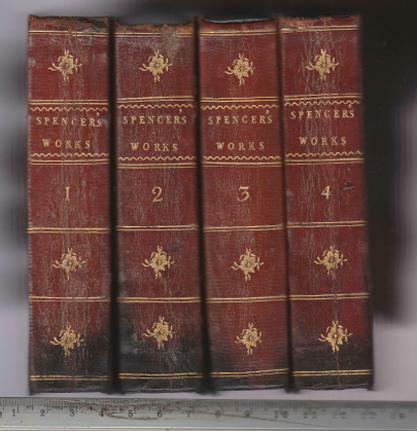 Spine spelling is "Spencer".possibly a binder's error.